It’s the season of travel. Schools are out, the weather is warm, and all over the country, people are preparing for journeys to faraway locations—vacations to new and unfamiliar destinations, but also often returns to the places that they identify as home. Of course, for the immigrant and the child of diaspora, “home” is an inherently complicated construct, riddled through with ghosts—of war, of imperialism, of other kinds of trauma—and with the specters of displacement and isolation and the feeling of perpetual rootlessness. In this June installation of Editors’ Corner, we’re featuring two recent collections by Asian American poets that explore this fraught relationship to geography, migration, and the notion of home. Melody Gee’s The Dead in Daylight (Cooper Dillon, 2016), her followup to her debut collection (which we previously reviewed here), parses the map of family geography with finely tuned musicality and a delicate and beautifully precise attention to image. In its pages, the reader drifts through an imaginative pastiche that splices together scenes from the domestic and the natural (from the garden to the living room to the hungry sea that laps at the seams of the collection and consumes the speaker’s mother in the final poem) and moves fluidly between the realms of the living, the dead, and the interstitial territory of memory and dream that lies between. At once origin story and narrative of perpetual departure and return, The Dead in Daylight digs undaunted into the wreckage of generational memory, recalling inherited histories of loss and longing and building around them delicate, earthbound constructions: beautiful, otherworldly houses of paper and bone, mud and salt, ink and flesh, that gather together the scattered geographical detritus of the immigrant lens together under their rooves—motherhood and labor, revolution and famine, rituals of birth and burial, the land and the ghosts that inhabit it. The poet intuits the fertile lyric possibility nestled within the silences and undocumented blips in a familial narrative that reaches across continents and generations, and like her speaker, who returns again and again to the garden, she tenderly plants them in earth, where they put down roots and bloom like the speaker’s asclepia (or milkweed plants, favorite flower of the migratory monarch) in “Of What Next,” planted in the faith that what she has buried will one day “call over / butterflies” (16), a crop of brilliant homecomings alighting at journey’s end. 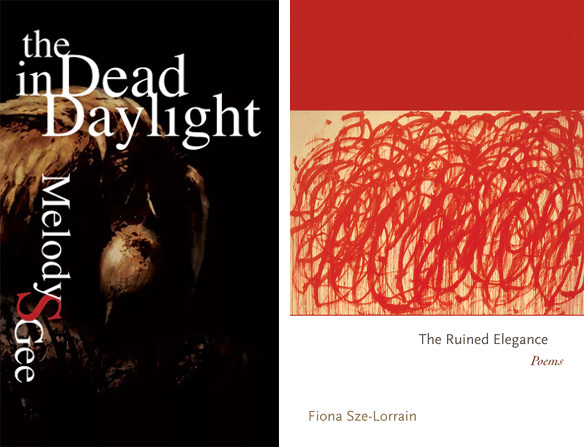 If Gee’s book grapples with a poetics of excavation by rooting, a burrowing into the earth in search of blood and filament with which to anchor the diasporic body, then Singaporean-French-American poet Fiona Sze-Lorrain’s latest collection, The Ruined Elegance (Princeton, 2015), can be said to point its gaze skyward, engaging in a magpie-like poetics of investigation by assemblage, a searching for new meanings and identities under the vast, universal canopy that hangs above the ruins of language, of history, of justice, of place and identity. The poems in Sze-Lorrain’s collection comprise a deftly curated gallery that takes on images of trauma and war (from a survivor’s account of Ravensbruck to scenes from the Cultural Revolution and from apparently contemporary political prison camps) by overlaying and skillfully collaging them together with ideas and images borrowed from European and Asian cultural touchstones. From the classical musical form of the partita (though not one of Bach’s, the poet is careful to note) to Magritte’s iconic The Son of Man to Joseon brush paintings and translated text borrowed from Chinese poets Zhang Zao and Gu Cheng, Sze-Lorrain carefully builds up layers of meaning and beauty around the rubble of written texts and oral narratives that have been erased by the violence of totalitarianism, the fickleness of memory, and the existential complexity of diasporic identity. She allows the ruins to become a kind of aesthetic in themselves, taking the absences as a kind of new form—startling and intentionally unbeautiful among the threads of the shimmering fabric that she weaves about and beneath them, stitching them together as a practitioner of kintsugi, a Japanese technique in which a shattered vessel is repaired by inlaying gold into the veins created by the cracks and missing pieces, might construct a new type of pot out of something once broken. It is here, in the glinting interstices of these carefully rejoined pieces, that Sze-Lorrain’s migratory speaker makes her home: “I want to honor / the invisible,” she says (5), and later, to “turn this ruined thought / into a poem” (45). What books are on your summer reading list this year? We’d love to hear about them! Leave us a comment below or share your best recommendations with us on Twitter, Facebook, or Instagram (@LanternReview). Editors’ Corner: What is the Landscape of APIA Literature? 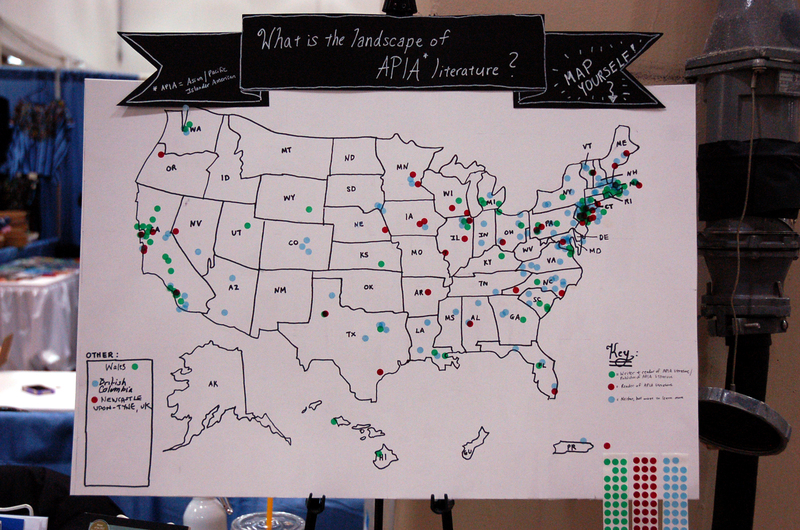 Our crowd-sourced map at AWP 2013. “What is the Landscape of APIA Literature?” reads the poster board map of the United States that I’ve stuck up on my bedroom wall. Red, green, and blue dots cluster over the black sharpie outlines of its borders, clotting layer upon layer in some locations (e.g. NYC, LA, SF, New England), and scattering more sparsely across others (there’s two lonely blue dots huddled together in the southeastern-most corner of South Dakota; while several states—such as Alaska, Idaho, Oklahoma, and New Mexico—remain blank). A key in the right hand corner provides some interpretation: green dots stand for people who identify as writers and readers (and/or publishers) of Asian/Pacific Islander American (APIA) literature, red for those who identify as readers (but not writers) of APIA lit, and blue for those who identify as neither a reader nor a writer of APIA lit, but are curious to learn more. The information on this map was “crowd-sourced” a few months ago at our the AWP bookfair table, where we and three other APIA lit mags (Kartika Review, TAYO Magazine, and Hyphen) invited passers-by to add dots representing themselves to the map according to the place of origin with which they most identified and their relationship to APIA literature. One of the things that struck us immediately was how very open people were to our invitation to “map” themselves. The act of adding oneself to a map carries its own particular appeal. To place yourself on a map is to make a statement about one’s identity; to declare one’s origins; to make one’s mark on a place; to speak for and represent oneself amidst a larger community. In the context of a conference as bewilderingly large and far-flung as AWP, especially, that seemed particularly important.